American car sales advanced 7% thanks to lower gas prices, more car makers rebates and better economic conditions. 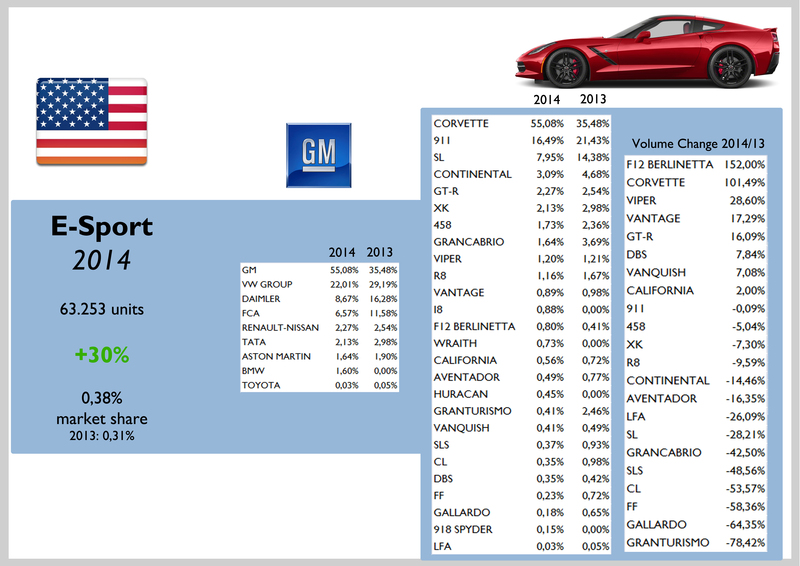 GM head the ranking with 18% market share but underperforming overall result, along with Ford and Toyota. FCA was the best performer among big players, rising its registrations by 17% thanks to its trucks and Jeep nameplates. The group was able to make use of the increasing demand offering a complete range of modern SUVs, trucks and minivans, whereas it improved its passenger car offer. 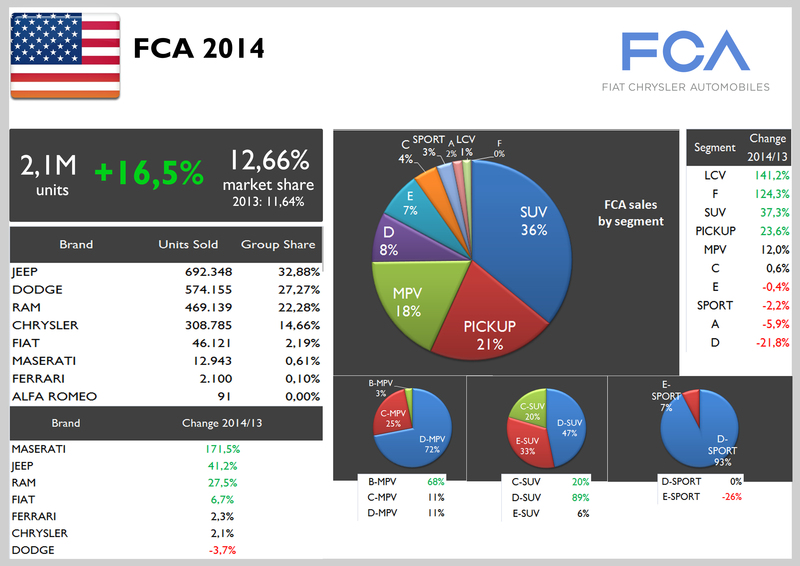 Once again USA was FCA’s largest single market counting for 46% of global sales. 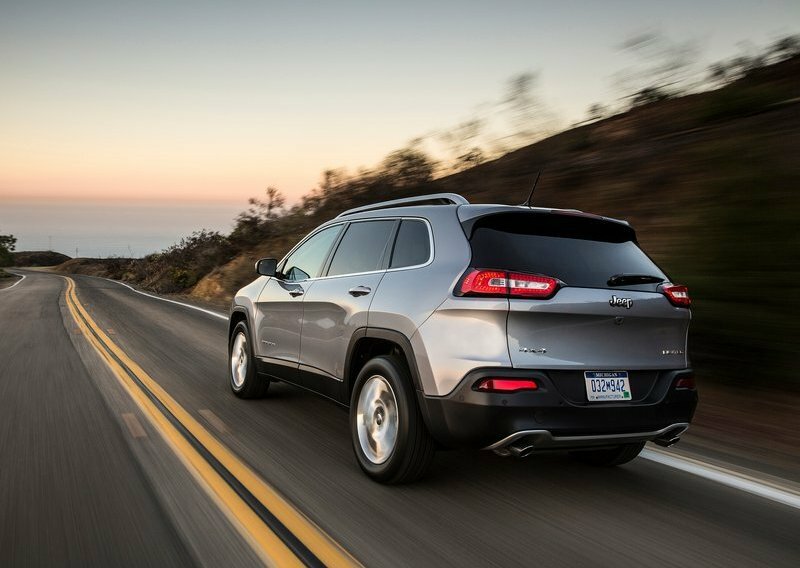 Awesome start for the Jeep Cherokee, while the Wrangler, Grand Cherokee, Ram Pickup and Dodge Grand Caravan remain at good shape. Bad for the Dodge Dart and the Fiat 500. Maserati impresses. Alfa Romeo finally started selling cars in USA. 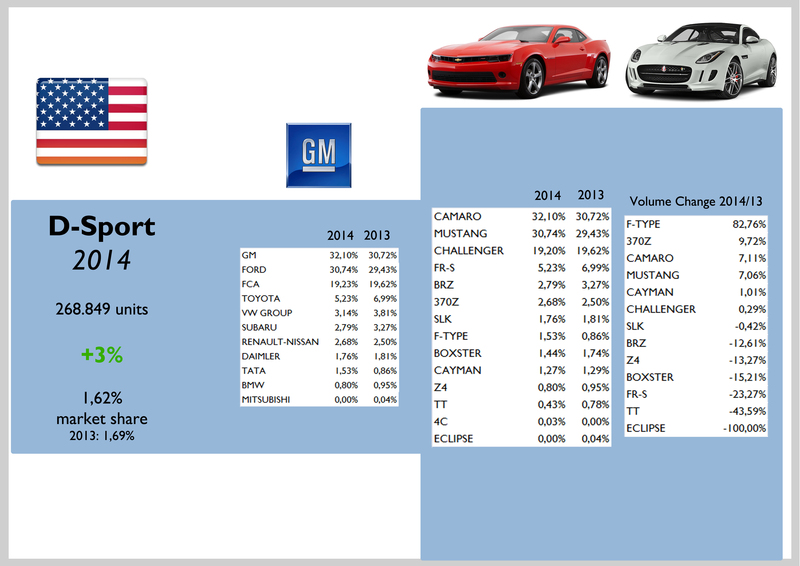 The gap between GM, Ford, Toyota and FCA narrows. VW Group sales count for only 4% of total market, not far from a small group such as Subaru. Mitsubishi got the best performance but it was possible not to the hottest segments (SUV and Pickup) but to the small cars, such as the Mirage. Very good for Subaru and Mazda. Bad for Tesla, down 9%. Daimler was the best German performer. Low gas prices means more demand for big cars: SUVs and Pickups demand grow more than overall market. Passenger car segments (from A to F) underperformed the market. FCA group was able to increase its market share by more than 1 basis point, which is a lot in a market like USA. It was possible thanks to Jeep and Ram brands, which together counted for more than half of the group’s total sales. Almost half of FCA SUV sales correspond to mid-size SUVs, Jeep Cherokee and Wrangler. The small ones (B-SUV) should gain some share with the arrival of the Renegade this year. The Ram Pickup is still the group’s best-selling product in USA and in the whole world. In 2014 its sales counted for 21% of FCA USA sales. Sales improved 24%. The Ram was followed by far by the Jeep Grand Cherokee, but its sales growth was so slow that the new Cherokee came quite close. The Maserati Ghibli sales posted a massive growth as the brand got more visibility and awareness thanks to the new products and advertising (2014 Superbowl Ad). Bad for the Dodge Dart, up only 0,6%. The Fiat 500 sales continued to plunge after reaching a sales peak on 2012 of 44k units, to 36k units in 2013. The Chrysler 200 and the Dodge Avenger were both affected by their production shut down (in the case of the Chrysler, the new generation started to have a positive impact during the second semester). 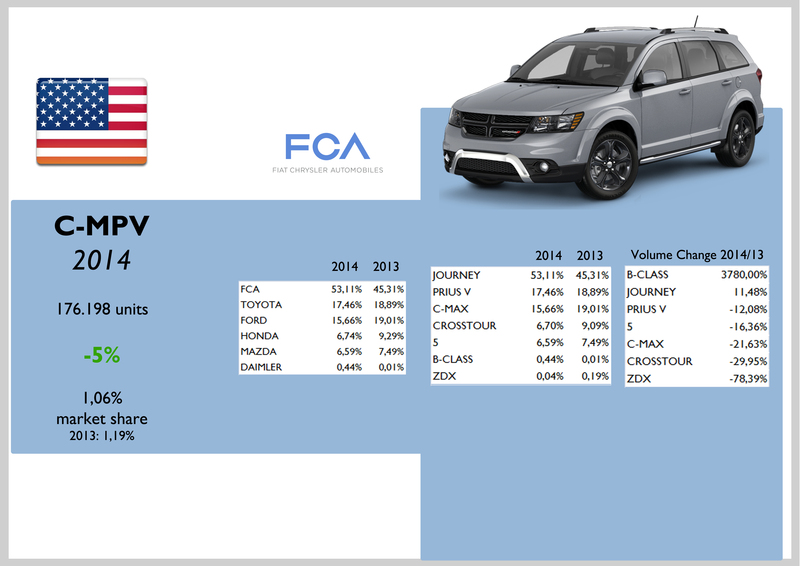 The Dodge Journey got again the highest segment share. 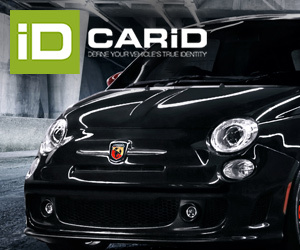 The Fiat 500 came next, but losing share. FCA is the absolute leader in the mid-size and large minivan segments. It is still weak in the ultraluxury sedan segment (even if the Maserati Quattroporte managed to more than double its sales). The biggest problem: the very low share in C-Segment despite the arrival of the new Dodge Dart. Source: Good Car Bad Car, JATO. Premium includes: Acura, Alfa Romeo, Aston Martin, Audi, Bentley, BMW, Cadillac, Ferrari, Infiniti, Jaguar, Lamborghini, Land Rover, Lexus, Lincoln, Maserati, Mercedes-Benz, Mini, Porsche, Rolls-Royce, Smart, Tesla, VW Beetle and Volvo. Premium segment lost share due to the rise on demand of trucks and some mainstream SUVs. BMW leads this segment but is closely followed by Daimler. 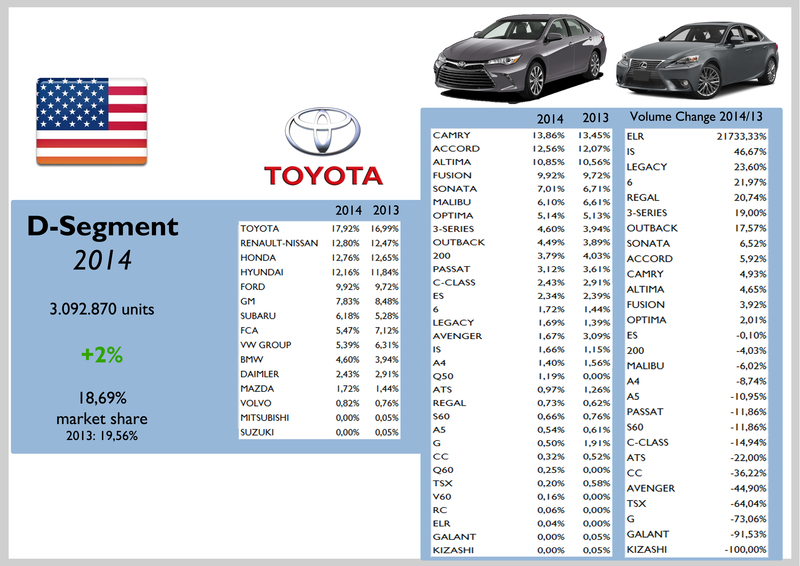 Toyota (Lexus) outsells VW Group (Audi, Bentley, Lamborghini and Porsche). 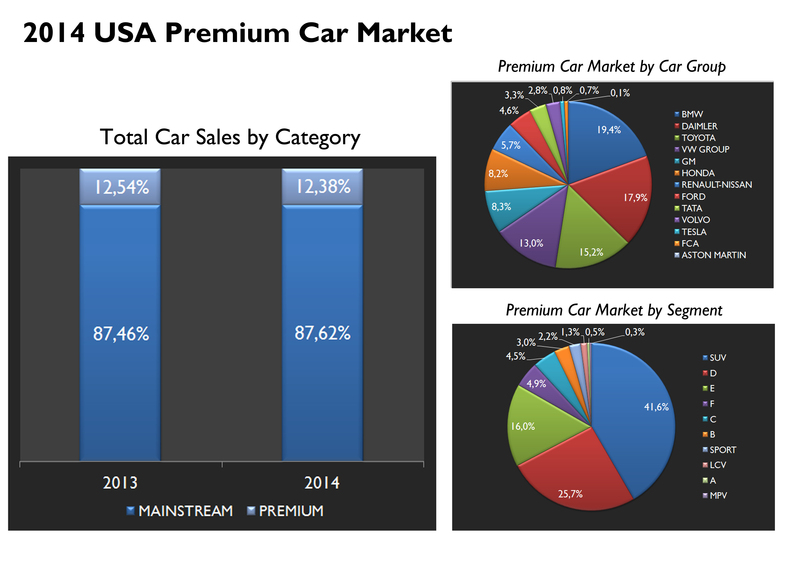 42% of premium cars sold in the US corresponded to SUVs. City-cars are still quite unpopular in USA. Their sales rose a tiny 2% mainly because of the good performance of the Chevrolet Spark and the Smart Fortwo. The Fiat 500 lost its crown as the best-selling minicar in America. The Chevrolet outsold it for about 3000 units. Subcompact cars sales remained stable last year with more than 550.000 units. 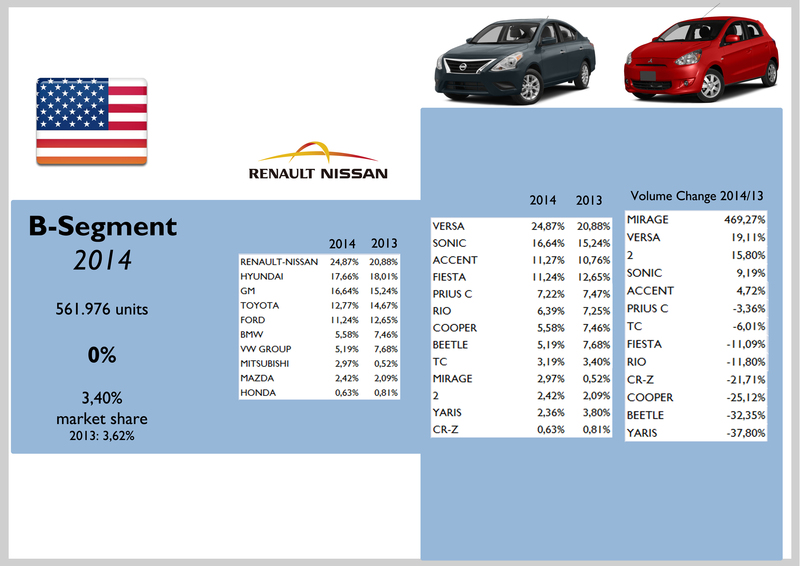 Renault-Nissan lead again the segment thanks to the popular Versa sedan. 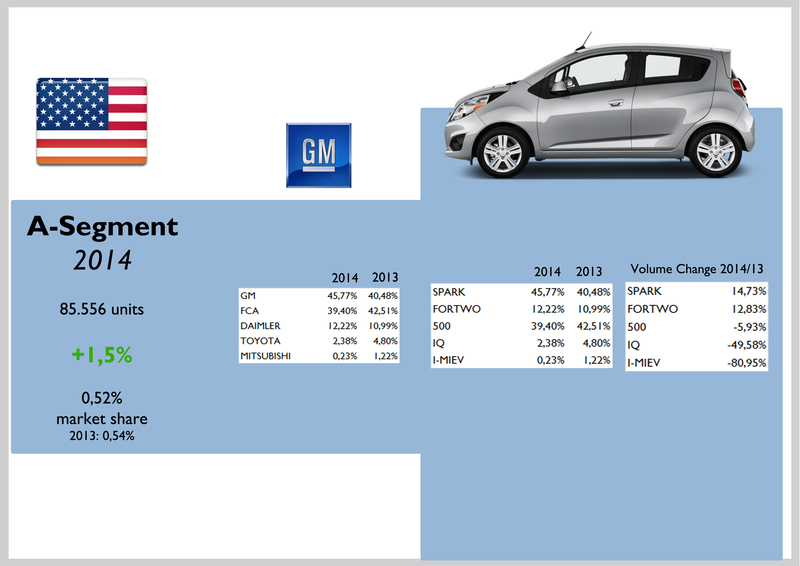 Hyundai comes second, while GM occupies third position with an increasing popular Chevrolet Sonic. The new Mitsubishi Mirage impresses. Bad for the Toyota Yaris and Ford Fiesta. 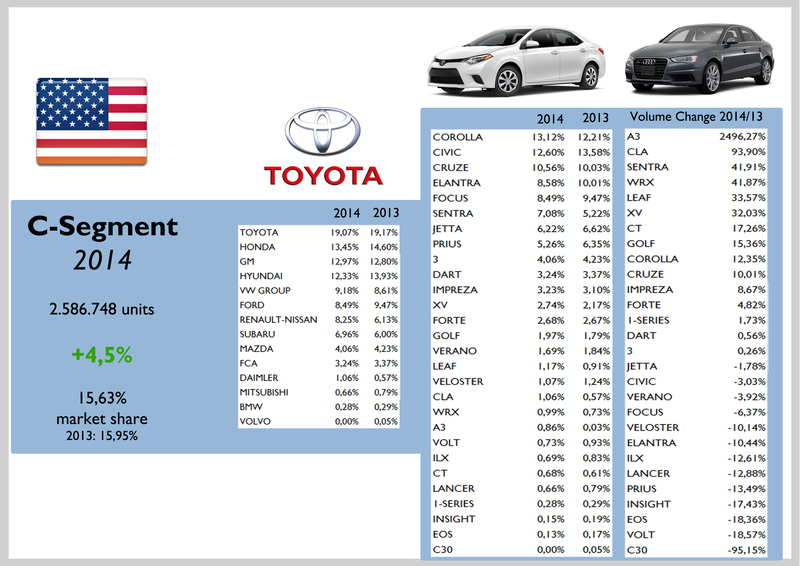 Toyota has a clear leadership in one of the most popular segments in USA. Last year the Toyota Corolla dethroned the Honda Civic as the best-selling compact car. The arrival of the sedan version of the Audi A3 allowed that nameplate to post an impressive positive growth. Still, it is still quite unpopular in the segment. Bad for the Chevrolet Volt, Honda Insight and Toyota Prius. The Dart didn’t perform well. America’s largest single segment registered a volume rise of only 2%. Once again Toyota heads the ranking with a big gap with the second place, Nissan. Hyundai and Subaru had good results. In the opposite side there are GM and FCA. Large sedans demand plunged 6% due to a shift to large SUVs (+6%). Thanks to the Chevrolet Impala and the Cadillac CTS, GM ranks first in this segment. However it is closely followed by FCA and its popular Dodge Charger. The Toyota Avalon outsold the Ford Taurus. The Mercedes E-Class was the best-selling premium large sedan, ahead of the BMW 5-Series, the Lincoln MKZ and the Cadillac CTS. Even if they are not direct competitors, the Buick Lacrosse allowed GM to lead the F-Segment, ahead of the German flagships. The news Mercedes S-Class impressed outselling the Cadillac XTS, but its positive growth was outperformed by the Maserati Quattroporte. The Mercedes more than doubled BMW 7-Series’ sales. The Kia Soul reigns thanks to its right mix of Crossover look and MPV roominess. The comes the Honda Fit and the Scion xB. The Fiat 500L didn’t shine due to recall problems during some months. The Dodge Journey is considered a compact MPV contrary to its positioning in Europe. Even if it’s quite old the Journey sales continue to grow. 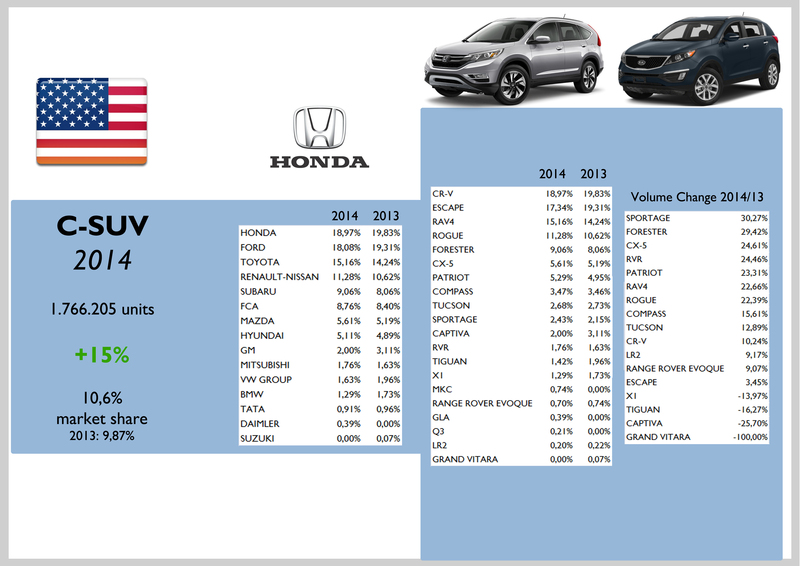 Big MPVs are still popular in USA. Nevertheless, their sales didn’t grow as much as total market. 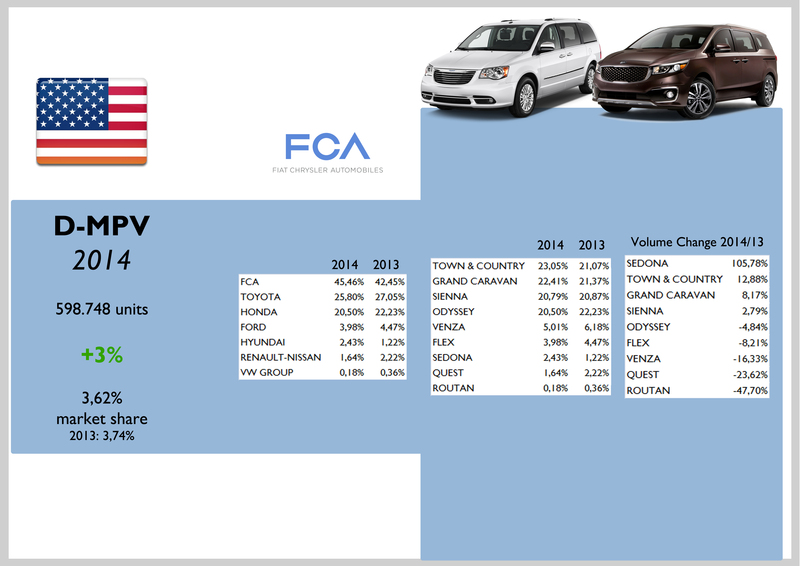 FCA controls more than 45% of this segment thanks to the twins Dodge Grand Caravan and Chrysler Town & Country. 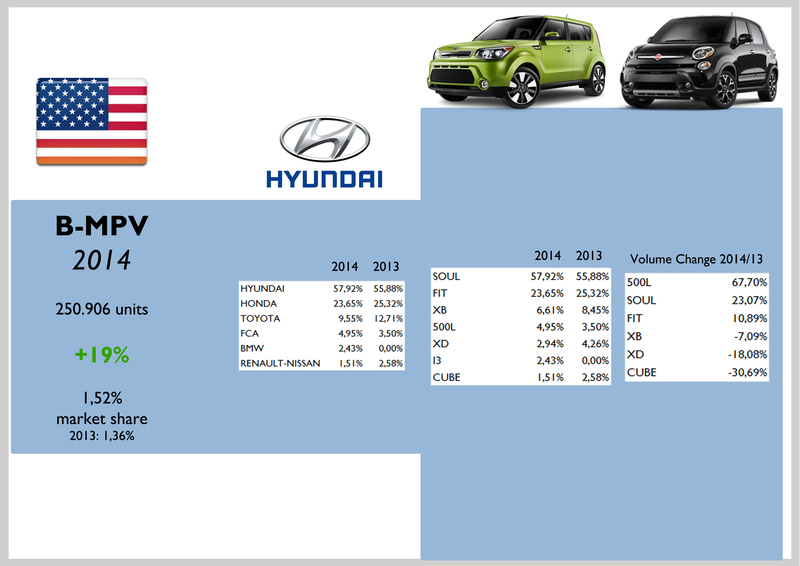 Small SUVs are still unknown but they gained share last year. This is because of the few offer with only 6 different options. The Buick Encore (aka Opel Mokka) leads this segment. This year the Jeep Renegade and the Fiat 500X will join it. 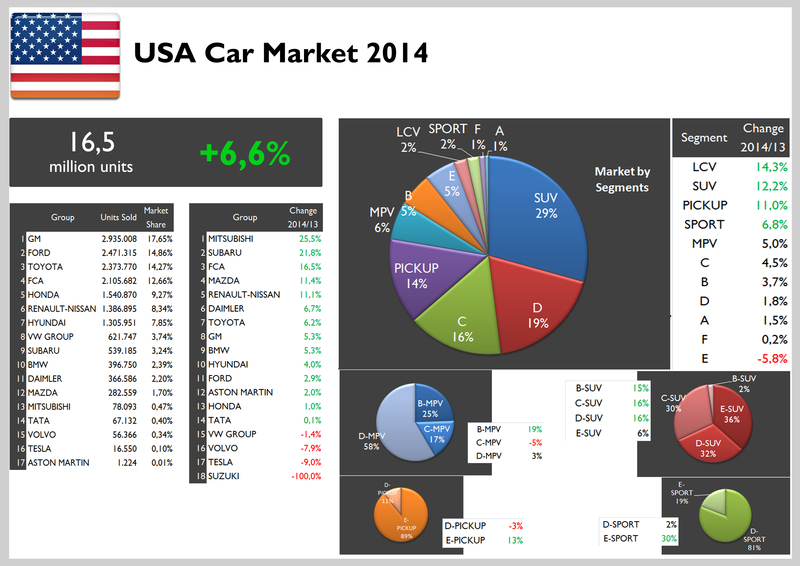 Compact SUVs are really popular and they managed to increase their share to 10,6% of total market. Honda and Ford lead but they lost share, which was gained by Toyota and Nissan. 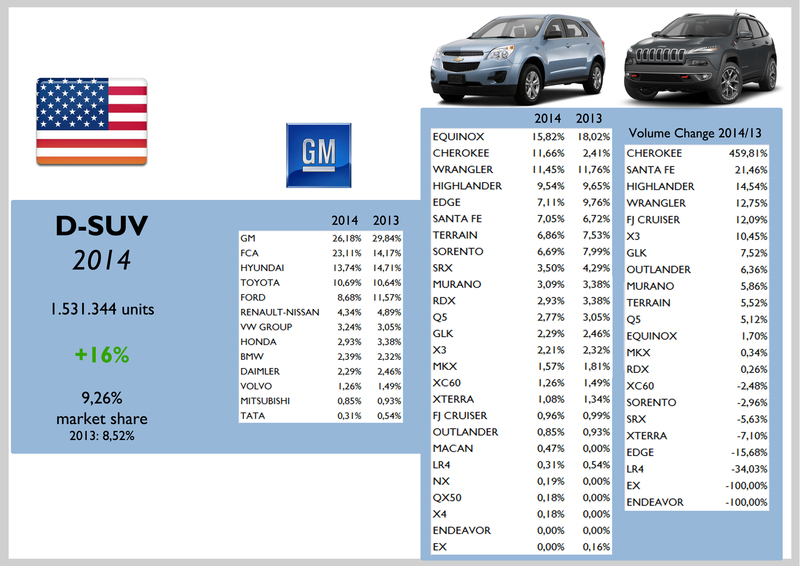 Big gain for mid-size SUVs with GM leading the ranking, and closely followed by FCA (Jeep). The Chevrolet Equinox felt the arrival of the new Jeep Cherokee, which had an amazing performance. The Ford Edge and the Kia Sorento did also suffer. The Audi Q5 outsold the BMW X3, Volvo XC60 and Mercedes GLK. 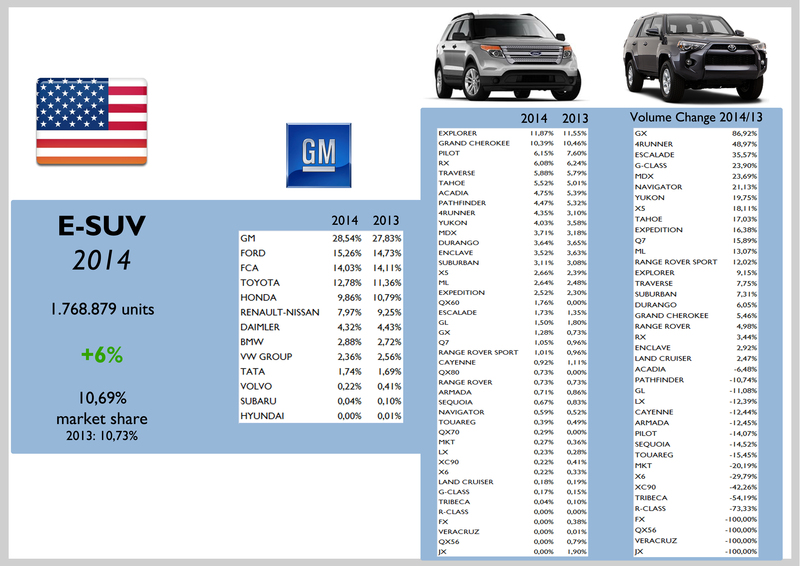 Large SUVs are the most popular. However their demand seemed to have reached a peak. 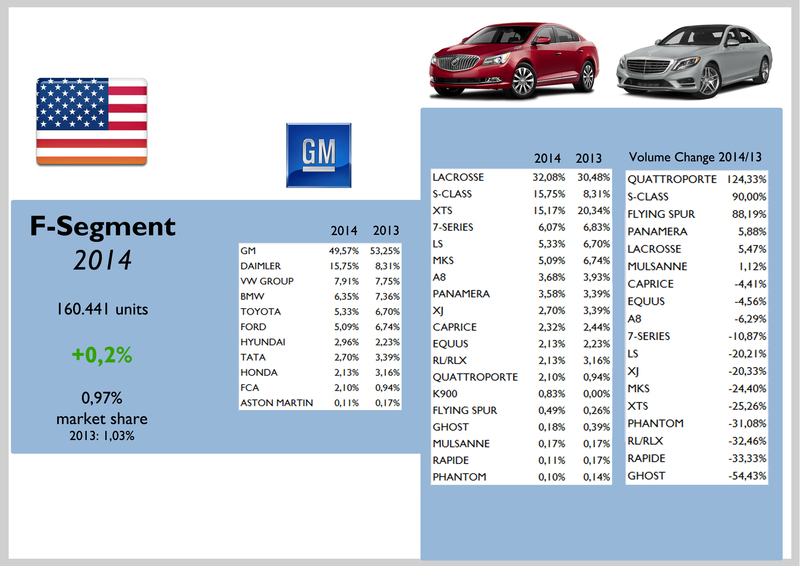 GM clearly leads ahead of Ford and FCA. This is because of the larger range of GM products. This is evident in the ranking by models, where GM places the Chevrolet Traverse in the 5th place, while the Ford Explorer and Jeep Grand Cherokee (eternal rivals) lead the segment. 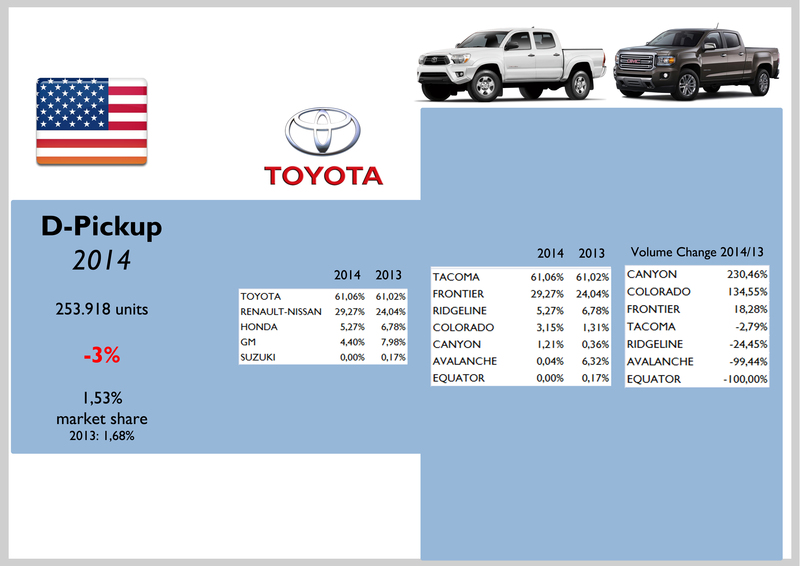 Toyota controls the mid-size pickup segment thanks to the Tacoma, the absolute leader. Ford reigns with the country’s best-selling nameplate, the F-150. 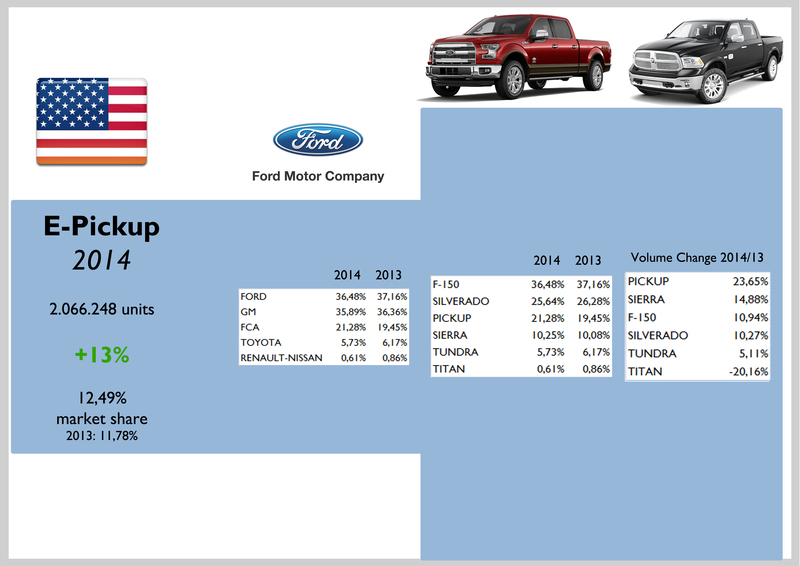 However if the Chevrolet Silverado and GMC Sierra sales are counted together, they get close to Ford. 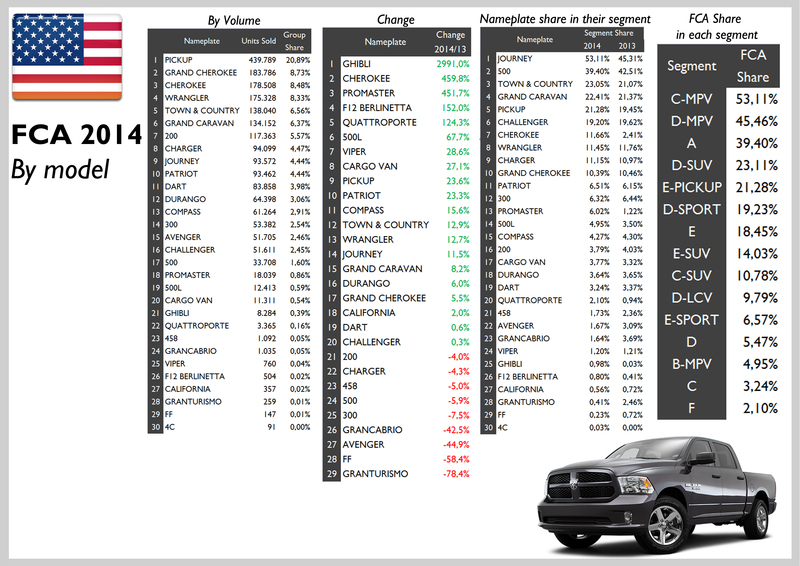 The Ram Pickup (aka 1500) was the best performer increasing its sales by 24%. This segment continues to grow. The new Ford Mustang didn’t dethrone the Chevrolet Camaro. The Germans are quite behind the leaders. The Chevrolet Corvette reigns in the supercars segment and thanks to the new generation, its sales more than doubled.